Gymnosperms are the plants of the great biodiversity, they have the tremendous evolution in the past, a whole palaeobotany in the Mesozoic era is the sign of the development of this great ecosystem in the past. Fossil pteridospermales, bennettitales and the cordaitales and pentoxylales are the examples of the fascinating fossil history of the plants. In this review articles we are presenting some of the aspects of the fossil order entitled as the pentoxylales. This fossil group was discovered from the several places of the world, some of the places were in India like the Mesozoic hills of Rajamaha lhills, however complete fossil ecosystem has not been reported in these places of the India as intact but the fossil coverage was incomplete, they were probably shrubs and the trees, they have the long and the short shoots, the short shoots have the male and the female sporangia with the sporangiophores on the tipsl, eaves were spirally arranged and they were polystelic, wood rays were uniseriates, leaves were found think and the lanceoloate and the venation was in the form of the open form instead of the closed network. Females organ were liked the stalked mulberries and the male organ were in the form of the sporangia with the pollen inside the cavity of the sporangia. The male sporangia were fused in the disc with the several kinds of sporangiophores on the disc. This fossil group has several kinds of the linkage with the other fossil groups and some of the peculiar feature which makes the order unique in the palaeobotanical world. Gymnosperms are the naked seed plants, they have the seed without the fruits and some of the features in the wood anatomy differentiate these plants from the angiosperms of the modern era. These remarkable the group empower the whole of the Mesozoic era of the millions of years ago however after the declines of the era there was tremendous declines in gymnosperm vegetation and they are now represented by the some of the lines or some of the genus which can be counted on the fingers. overall there are two lines of the evolution one of them is the cycadophytes and another line of the evolution is the coniferophytes. Cycades are the small and they have the very relict distribution in the world, overall, they have the 11 genera and they are distributed in some of the places of the world and they are near the extinction. IUCN declared these cycadas as the endangered species or near to extinction on the basis of the IUCN old and new version 3.1 and another parameter. Other liens of the gymnosperms are the coniferophytes, they are very different from the cycadales, majority of the are now presented by the conifers belts of the northern hemisphere of the world. They are evergreen plants with the needles like of the foliage, the reproduction occurs by the male mad the female’s cones which are present on the different branches of the long and the short shoots [1-7]. Economically as well as from the ecologically point of view the gymnosperms are very useful plants and they have a very good reservoir of the genes and the metabolites of the medicinal values, from the ethnobotanical aspects many of the tribes of the forest utilises the gymnosperms plants parts for the Varity of the purposes. This line of the evolution needs the conservation, national as well as the international efforts are needed for the conservation of these liens of the evolution [1-11]. Figure 1: Reconstruction of the male shoots of the pentoxylales (sources ucmp.berkeley.edu). This small group is the relatively new discovery, the name Pentoxylales has been proposed by the sahani in 1948 to this small group of the fossil plants based on the paper presented by the shrivastava on the pentoxylales seed Bearing organs and the stem and the leaves of the form genera’s [12,13]. At that time the male organ was not reported, it was worked by the Vishnu mitre in 1953. The group has some of the familiarity with the bennettitales and some of the features in common with the cycadales and some of the features are unique. Fossil of the pentoxylales have been reported from the Jurassic periods of the differ rocks . They have been reported from the one of the locality of the north eastern India ( Rajmahal hills ) as well as some of the part have also been reported form the new Zealand. The fossil has been found in the form of the silica and the petrified form . In these petrified forms two of the genera have been reported these are the Nipanioxylon and the pentoxylon. Both genera’s have the polystelic structures, pentoxylon ranges from the 2 m to the 3 cm in length. They have been found to reported five steles so the name of the order as the pentoxylalaes. Each stele has its own cambium, which is active in whole of the system but in older stem the growth is eccentric. In addition to that five smaller steles have been also reported in the stem of the fossil genera of the pentoxylales, these small stele may have been related to the short shoots, Vishnu mitrae and the sahani worked on the detail anatomy of the stem of the Nipanioxylon and the Pentoxylon. They find that there were the major variants in the vascular bundles form the top to the bottom, how significant these finding was under investigations. If they were the permanent features of the stem or they were the resultant of the environments fluctuations [12,13]. The secondary wood found to be very compact and in structure they resemble with the Araucaria, uniseriate and the multiseriates boarded pits are the features of the Nipanioxylon wood as well as the Pentoxylon wood (Figure 2). 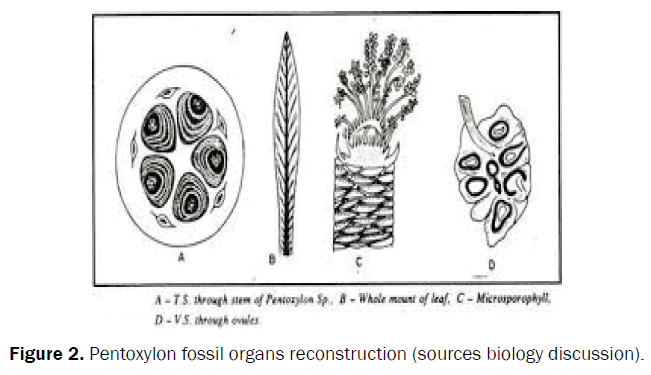 Figure 2: Pentoxylon fossil organs reconstruction (sources biology discussion). The leaves of the order are described as the Nipaniohyllum. They were born on the short shoots. Originally, they were described as the Taeniopteris.The leaves were found to be the strapped shaped and they have the midrib with the lateral branches without the any anastomies or network [12,13]. The significant features of the leaf anatomy were the presence of the leaf traces and their detailed anatomy which was worked by the vishnu mitrea and the shanni of the Jurassic rocks of the India. The stomata of the leaves were found to be the syndetochelic types which resembles with the bennettitales [12,13]. These structures have never been reported in the plants directly, they were found near the stem and the shoot remains, so exact attachment with the bodying is the matter of the discussion. The seed-bearing structures has been termed as the cornaconites, they have been looked as the stalked mulberries, the mulberry like of the infructscenes in the C. compactum found to be the 2 cm long [12,13]. It was reported that 20 ovules were present on the dome shaped receptacles. the interseminal scales were never reported on the ovules, in that features they were different form the bennettitales [12,13]. The pollen bearing structures were the Sahina nipensis, in which the male organ was present on the dome shaped receptacles with the sporangiophores (Figure 3) [12,13]. 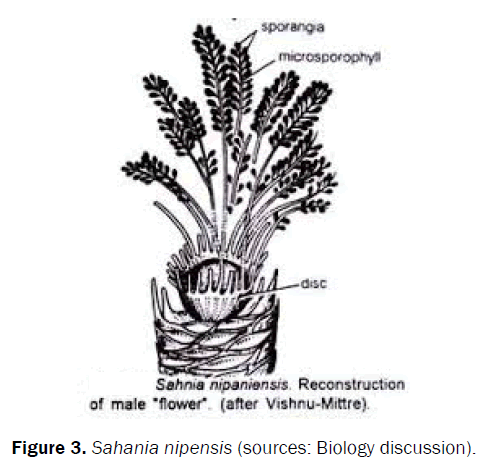 Figure 3: Sahania nipensis (sources: Biology discussion). The correct phylogenetic placement of the pentoxylales is the matter of the discussion, since on some features they resemble with their near orders like the bennettitales and cycadales but in some of the features they are totally unique in natures. Overall the group is very valuable from the evolution point of view. Fritz WJ. Reinterpretation of the depositional environment of the Yellowstone “fossil forests”. Geology. 1980;8:309-313. Fritz WJ. Reply to Comment on “Reinterpretation of the depositional environment of the Yellowstone “fossil forests”. Geology. 1981;9:53-54. Fritz WJ. Comment and Reply on “Yellowstone fossil forests: New evidence for burial in place”. Geology. 1984;12:638-639. Garcia FA and Miller DS. Discovering Fossils. How to Find and Identify Remains of the Prehistoric Past. Pennsylvania. 1998. Gardner and Martin. “A Skeptical Look at Karl Popper,” Skeptical Inquirer. 2001;25:13-14. Kitcher and Philip. Living with Darwin: Evolution, Design, and the Future of Faith. New York. 2007. Knoll H. Het Late Krijt van Aken en omgeving: Deel 1-Verkiezeld hout, dennenappels. 2010a;8:181-185.Knowlton FH. The Fossil Forest of the Yellowstone National Park. USGS Monograph 32. 1899;651-791. Kuban GJ. An Overview of Dinosaur Tracking. 2009. Leo RF and Barghoorn ES. Silicification of Wood. Botanical Museum Leaflets, Harvard University. 1976;25. Leo Lesquereux Autobiography, American Philosophical Society. Leopold EB and Clay-Poole ST. Fossil leaf and pollen floras of Colorado compared: climatic implications. 2001. In Evanoff E, Gregory-Wodzicki KM and Johnson KR. Fossil Flora and Stratigraphy of the Florissant Formation. Colorado.17-55. Sahni B. The Pentoxyleae: a new group of Jurassic gymnosperms from the Rajmahal Hills of India. 1948;110:47-80.